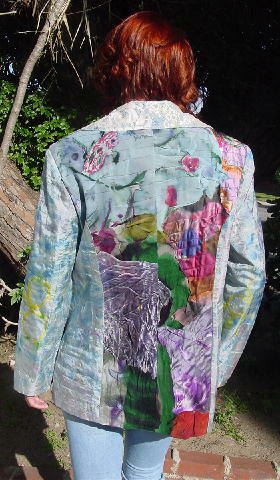 This never-worn (except for these pictures) synthetic fabric one of a kind jacket is by Sara and Rodrigo Palacios and was made in the USA. It has a black synthetic full lining, long sleeves, and shoulder pads. 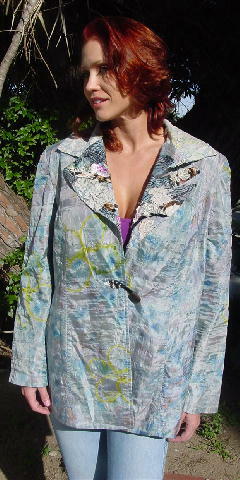 There are long lapels and a fabric covered one button and loop closure. The base color is in multiple tones of blue, brown, yellow, and bone. The collar has lace and the lapels have lace, netting, and various types of fabric sewn on the base fabric in black, white, magenta, pink, browns, and sand. The center back has no fabric base, and the various types of fabric are just sewn onto the black lining. 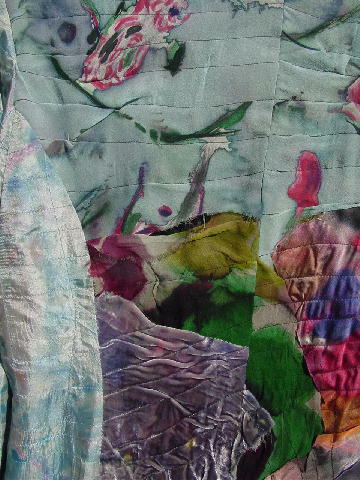 These fabric panels are in blue-gray, light gray, orange-red, light purple, greens, pinks, black, and blues. The tag says M, but it fits more like a size M/L. shoulder to shoulder 17 3/4"
shoulder pad to shoulder pad 19"